Bright blue skies, warmer temperatures and buds popping out on your flowering shrubs are luring you outside. And, if your family is like my family, you know you’ll soon be spending the next several months eating, entertaining and relaxing outside. So it’s time to take a hard look around and evaluate how your outdoor space looks. Need a simple spruce or a major overhaul? No problem. The solutions are as easy as your ABC’s! A is for Arbor. What could be better than finding new places to plant flowers? 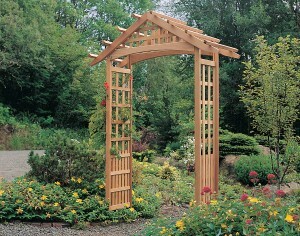 Arbors are eye-catching structures which create magical entries to your beautiful garden. They add vertical beauty and allow stunning climbers to thrive. Arbors at Fifthroom.com come in a variety of styles and materials from pine and cedar to maintenance-free vinyl and poly lumber. B is for Bistro Set. Who doesn’t love a charming bistro set out on the patio or deck? We carry many, many styles but one of our most popular bistro sets is this Red Cedar Bistro Patio Dining Set. Add chips, salsa, a glass of wine or two and you’ll be all set! C is for Cushions. Cushions add comfort and color to every outdoor space. 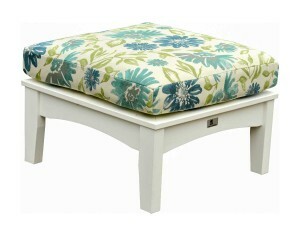 But outdoor cushions need to be as tough as they are beautiful to stand up to sun, rain and some occasional kid spills! We’ve got just what you need with our durable Sunbrella cushions which come in 27 fabulous fabric colors. D is for Deep Seating Collections. Have you been dreaming of the perfect lounging area for reading, relaxing or simply hanging out with the family? 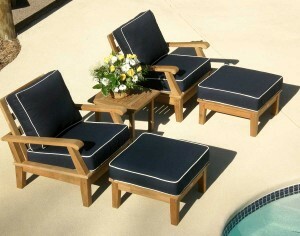 Then you need one of our ultra-comfy deep seating sets! One special favorite is our Teak Port Sectional and Chair Collection which customers tell us is pretty enough to use inside as well as outside! E is for Extra Touches. 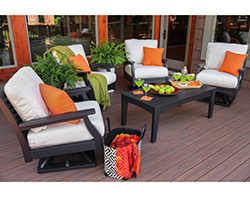 Sometimes little things really do mean a lot, especially when it comes to outdoor living. Like ottomans and footstools where you can put up your feet and really relax. 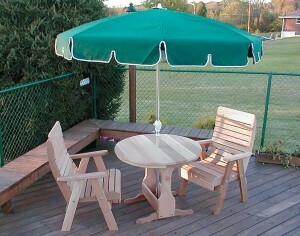 Or umbrellas to provide shade and outdoor ceiling fans to keep cool breezes blowing on even the hottest days! F is for Fire Pits. 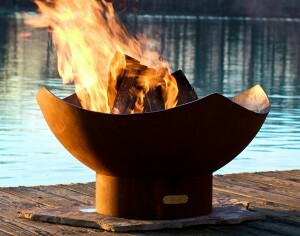 Everybody loves gathering around the fire pit late in the evening and fire pits extend your outdoor time immeasurably! We’ve got some beauties including a dramatic stunner, our Manta Ray Fire Pit constructed of American carbon steel, each one numbered and signed by its craftsman. G is for Gazebo. A gazebo with its solid roof and open sides gives you a protected, cozy outdoor space which allows you to be outside even when summer storms blow through. Plus, it makes a wonderfully dramatic focal point to your backyard. Gazebos are one of our specialties at Fifthroom.com and we have lots of styles to choose from. H is for Hammock. Hammocks are amazing. They’re comfortable, charming and extremely versatile. They get you outside (though chic decorators are using them inside, too) and are oh, so portable. And, when one appears in somebody’s yard, there’s a race to see who can climb into the hammock first! No doubt about it, Hammocks absolutely, totally rule! As you can see, there are lots of ways to update your outdoor space (and we’ve got lots more letters of the alphabet to go through!) It doesn’t take much to make a big difference so, take a good look around and when you’re ready to spruce up your space, check out all of the beautiful things you can find online at Fifthroom.com!